Spirit Style 3 Hydrocolloid Sheath Male External Catheter, manufactured by Rochester Medical, combines breathability and flexibility to help men with incontinence improve their quality of life. External catheters are used to treat the common condition of incontinence. They provide the patient with a solution that is less invasive than intermittent catheters. This external catheter provides 70 percent more adhesive than traditional self adhering designs to help prevent accidental catheter detachment. The Spirit Style 3 Hydrocolloid Sheath Male External Catheter is the first self adhering male sheath to combine the moisture wicking abilities of hydrocolloid adhesive and breathable silicone. The hydrocolloid in this sheath works with the silicone to transport the moisture to the breathable surface where it can evaporate and prevent moisture build-up. This innovative fusion offers the user a secure fit and exceptional comfort. The sheath gives the user confidence and helps provide skin integrity while helping promote skin health. This sheath catheter can be used with a drainage bag to provide a complete urinary incontinence solution. 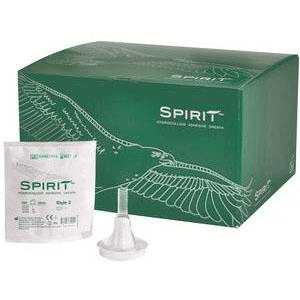 BUY Spirit Style 3 Hydrocolloid Sheath Male External Catheter from Vitality Medical today. changed every 24 hours for proper hygiene. These are made from a thicker silicone than the others and the adhesive is good. You need to be soap and water clean and dry before putting it on. For better security wipe down with rubbing alcohol after soap and water and dry. Removing the oil from you skin give the best adhesion possible. I sampled many external catheters and this is the only one that I trust. Everything else falls off. The downside is that this adhesive can be difficult to remove. Spirit Style 3 Hydrocolloid catheter stay in place very well. It also irritates my skin the least.